It required long runways for takeoff and landing. This imposed great threats to airfields as long runways tend to be easy targets during air raids. Poor low altitude performance due to its delta wing configuration which was designed for performing well at high altitudes. Low fuel capacity which meant less range and less time during dogfights. Poor armament in comparison with its western counter parts (2-4 short range missiles in comparison with 4 short range and 4 medium range missiles in the F-4 Phantom II). No BVR (Beyond Visual Range) capability due to its poor radar. Its range had to be longer than that of the MiG-21. It had to support shorter runway distance for takeoff and landing. It had to perform well at all attitudes. It had to support BVR. MiG design bureau formed a team headed by its founder and chief designer Artem Mikoyan to design this new fighter. Though the design bureau was also working on designing the Soviet Union’s Mach 3 capable interceptor (MiG-25), Artem Mikoyan was advised by his doctors (due to his heart condition which developed during the design of the MiG-15) not to be involved in this project as it was very demanding. This was to be Artem Mikoyan’s last project until his death in 1970. 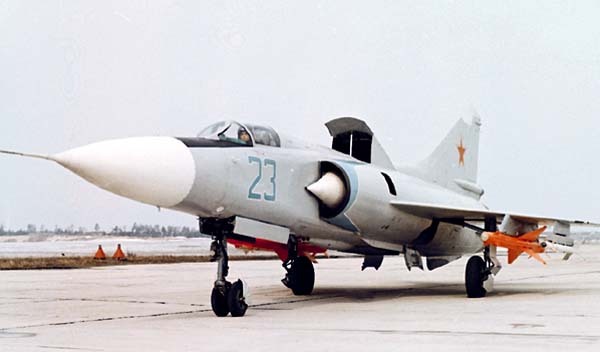 The first prototype of MiG’s new fighter, called "23-01", was a tailed delta similar to the MiG-21 but with two lift jets in the fuselage. However, it became apparent very early that this configuration was unsatisfactory, as the lift jets became useless dead weight once airborne. The second prototype, known as "23-11", featured variable-geometry wings which could be set to angles of 16, 45 and 72 degrees, which was clearly more promising. The maiden flight of 23–11 took place on 10 June 1967, and three more prototypes were prepared for further flight and system testing. All featured the Tumansky R-27-300 turbojet engine with a thrust of 7850 kp. The order to start series production of the MiG-23 was given in December 1967. The General Dynamics F-111 and McDonnell Douglas F-4 Phantom II were the main Western influences on the MiG-23. 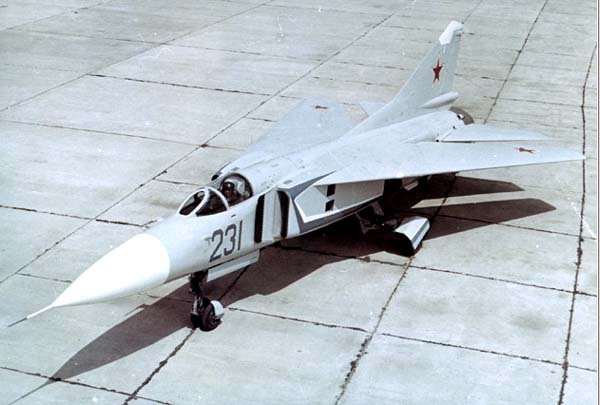 The Soviets, however, wanted a much lighter, single-engine fighter to maximize agility. Both the F-111 and the MiG-23 were designed as fighters, but the heavy weight and inherent stability of the F-111 turned it into a long-range interdictor and kept it out of the fighter role. The MiG-23's designers kept the MiG-23 light and agile enough to dogfight with enemy fighters. The design of the MiG-23 was capped by a conical assembly housing the radar system. The cockpit was situated just aft of this assembly and featured seating for the pilot with adequate views forward, above and to the sides. Cockpit vision was hindered by way of the raised fuselage spine and high-mounted wings, both playing critical roles in the variable geometry wing process. Rear-view mirrors helped to an extent but the priority for the design was always in forward and downward visibility from the cockpit at high speeds. 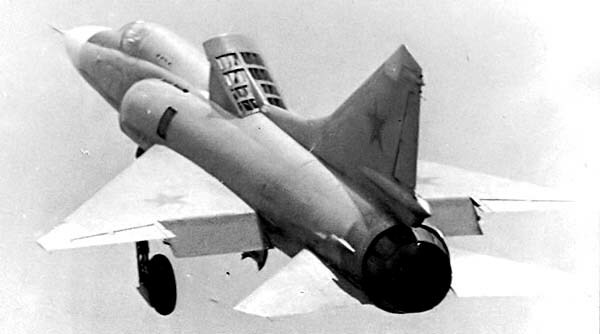 Going against previous Mikoyan-Gurevich jet designs and their identifiable nose-mounted intakes, the MiG-23 utilized split rectangular side intake inlets with each opening fitted to either side of the fuselage, just aft of the cockpit. From there, the fuselage took on a tubular look with slab-sides. The empennage consisted of a large single engine exhaust ring, a large-area tapered vertical tail fin emerging from the fuselage spine and sporting clipped and swept edges and strong conventional horizontal tailplanes. A ventral fin was noted just under the engine exhaust housing. One of the definitive characteristics of the MiG-23 became its tricycle landing gear arrangement with all three centered along the fuselage. The complicated main landing gears retracted into housings along the sides of the fuselage and were single-wheeled. The twin-wheeled nose landing gear recessed rearwards just under the cockpit floor. When at rest on the ground, the MiG-23 definitely maintained a pronounced and distinct appearance all her own. Of course the most notable exception in the MiG-23’s design lay in its wings. The wings were extended from the main fuselage body via static swept-wing "gloves" located at the wing roots. The variable geometry wing system allowed for three modes of flight that included take-off/landing, cruising and high-performance. The initial mode with wings fully extended sported a (approximately) 16-degree sweep angle and was sufficient in promoting stable low-speed flight by incorporating more drag and lift. The second mode, this at a 45-degree sweep angle, was used in typical cruising actions where a balance of drag and sweep was optimal. The final mode saw the wings fully-retracted by way of a 72-degree sweep, allowing for good high-performance flight at altitude by decreasing drag and forward surface area. The value of such a system would still allow the MiG-23 to carry a potent ordnance load across fuselage, wingroot and underwing weapon stations while still retaining strong performance output. Additionally, the MiG-23 afforded its operators an increase in range that would make the MiG-21 envious. Like the MiG products before it, the lethality of the MiG-23 was made potent by its ever-expanding weapons suite primarily coupled to the radar, HUD (Heads-Up Display) and gunsight. Standard armament became a twin-barreled 23mm Gryazev-Shipunov GSh-23L cannon with 200 to 260 projectile rounds (sources vary) mounted in a GP-9 gun pack under the fuselage. Six total hardpoints allowed for up to 6,600lbs of external stores. Hardpoints included two fuselage stations, two underwing "glove" stations and two underwing pylons for the fitting of various air-to-air missile systems. Cleared missile systems eventually included the AA-7 "Apex", AA-8 "Aphid", AA-10 "Alamo", AA-11 "Archer" and AA-12 "Adder" missiles of differing seeker heads and engagement range. A typical interceptor loadout became 2 x AA-7 "Apex" radar/infra-red and 2 x AA-8 "Aphid" short-range infrared missile assortments. In 1974, "double pylons" - fitting two missiles to one weapon station - were fitted for increased loadouts. The resulting expansion of the MiG-23 as a ground attack fighter enabled the type to bring to bear a bevy of conventional drop bombs, napalm, rocket pods and air-to-surface missiles as needed (as well as nuclear-tipped weapons). Further development would create the dedicated MiG-27 series variant. The MiG-23 took part in various conflicts around the world but mostly in the Middle East. Syria received the MiG-23 in 1973 and first used it against the Israelis in 1974. On 19 April 1974, Captain al-Masry, flying a MiG-23MS on a weapons test mission, spotted a group of IAF F-4Es and shot two of them down after firing three missiles. He was about to attack another F-4 with cannon fire, but was shot down by friendly fire from a SAM battery. Due to this success, an additional 24 MiG-23MS interceptors, as well as a similar number of MiG-23BN strike variants, were delivered to Syria during the following year. In 1978 deliveries of MiG-23MFs started and two squadrons were equipped with them. Egypt became one of the first export customers when in 1974 bought eight MiG-23MS interceptors, eight MiG-23BN strikers and four MIG-23U trainers, concentrating them into a single regiment based at Mersa Matruh. By 1975 all Egyptian MiG-23s had been withdrawn from active duty and placed in storage. Sometime in 1987, Egypt had sold its entire MiG-23 inventory to China and the US. The MiG-23 also took part in the Iran–Iraq War and was used in both air-to-air and air-to-ground roles. The reports about performance in air combat are mixed – some authors claim that Iraqi MiG-23s had some victories and several losses against Iranian F-14s and F-4s. For example it is said that Colonel Mohammed-Hashem All-e-Agha was shot down by an Iraqi MiG-23 while flying his F-14 on 11 August 1984. Furthermore, Capt. Bahram Ghaneii was shot down by a MiG-23ML on 17 January 1987. According to Iranian sources, four MiG-23s were shot down by F-14s on 29 October 1980. According to researcher T. Cooper, Iranian F-14s caused exceptionally heavy losses to the MiG-23s early in the war, much to the disappointment of the Iraqi Air Force, which thought that the Soviet fighter would be a match for the Tomcat. During the Iran-Iraq War at least 58 MiG-23s are claimed to be shot down by F-14s and 20 MiG-23s are claimed by F-4s. During the Persian Gulf War, the USAF reported downing eight Iraqi MiG-23s with F-15s. Some Russian sources claim that a U.S. F-16 and an Italian Tornado were shot down by Iraqi MiG-23 in this war; however the Italian Air Force maintained that the only Tornado lost during the war (pilots: Bellini and Cocciolone) was shot down by a ZSU-23-4 Shilka AA cannon. Other claims include the story about an Iraqi pilot named Hassan, flying a MiG-23 having supposedly damaged an F-111 with an R-24T missile at 4:30 somewhere south of Balad airbase, and at 5:10 another F-111 (tail number 70-2384) being damaged by another R-24T missile fired by a MiG-23. I have seen the MiG-23 a year ago in the Deutsches Museum Flugwerft Schleißheim, Munich, Germany. This one was flown by East Germany’s Air Forces of the National People's Army. I own a Model Power Postage Stamp 1:136 die cast model of the MiG-23. I also own a model of the MiG-27. Over 5000 MiG-23s were produced from 1970 until 1985. It is still in active service in 10 countries and served around the world in more than 20 countries. During its development, another Soviet interceptor was being designed to counter America’s Mach 2-capable Convair B-58 Hustler and the even faster North American B-70 Valkyrie. That interceptor was the Mach 3 capable MiG-25 Foxbat. It was the second fastest and second highest-flying military aircraft ever fielded after the SR-71 reconnaissance aircraft. The story of MiG aircraft continues with the story of the MiG-25 in the coming article. Stay tuned. Well well well done, Ahmed! Our Mig articles collection is growing !! Thanks for that ! Hopefully I will be posting the MiG-25 article very soon.